#LASD recognizes the need for transparency and the need to update the citizens of Los Angeles County and around the world about newsworthy events, safety tips or general law enforcement information. In today’s world the impact of social media plays an ever increasing role to provide information. As a world leader in law enforcement, we take our messaging seriously and want to provide the best information possible. 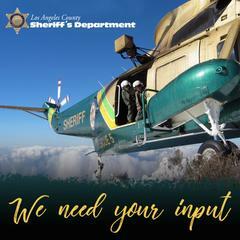 In July of 2018, LASD launched its first ever survey about our use of social media which was posted on our Facebook and Twitter sites. If you didn't know, we’ve reached yet another social media milestone and currently have 158,000 Facebook and 82,000 followers. This time, we need your help to get better information out to the public and reach more people through our social media sites. Let us know your thoughts and how we can improve to better keep you informed. Please click the link below to answer the survey questions. The survey will be open until August 15. We are constantly looking for social media best practices and your input is not only valuable but appreciated. Thank you.